The Polo has always been on the premium side of the small car market. It feels expensive, well built and as of the last update, features a very premium looking cabin. But what was holding the car back was its frustratingly weak 1.2-litre three cylinder diesel engine. 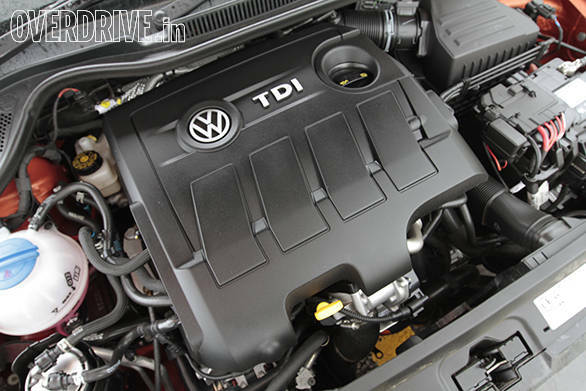 Volkswagen took care of that with the GT TDI that came with the 1.6-litre diesel from the Vento. It was the car the Polo should have been from the very beginning but predictably, the pricing went up quite a bit since the engine no longer fell under the 1.5-litre mark to qualify for small car excise benefits. So VW finally had a great small car on their hands but few people could afford the near ten lakh on-road price it commanded in Mumbai. The solution of course was to build an engine that conforms to the 1.5-litre rule while performing as or nearly as well as the bigger four cylinder engine we so loved. The Polo you see here is the first car that gets this motor which is going to be available in two states of tune. The Polo will get the lower state while the motor will be pumped up to a higher output in the bigger Vento and the future Polo GT TDI. When we first drove the new Polo we didn't know what power the engine was making since VW hadn't shared the specifications with us when we picked up the car. Perhaps the best compliment we could give the engine at that point was that it felt very similar to the 1.6. The noise from the engine was a familiar thrummy note and the engine offered plenty of low down torque. The meaty torque band is actually the biggest characteristic of this engine. Ease off the clutch and the car pulls cleanly ahead without any clatter from as low as 1,000rpm. In bumper to bumper traffic we found that you don't really need to use the throttle at all and the car simply pulls cleanly under its own torque. In fact, you hardly ever need to use first gear since the engine hauls forward without any complaint in second gear even from very low speeds. The clutch is not very light and you will be thinking about it when you're stuck in heavy traffic but at the same time it won't leave you with a sore left leg. The gearbox feels the same with a precise but occasionally rubbery feel, especially when shifting from second to third. The engine's torquey nature makes sense given the 230Nm of torque this engine generates from just 1,500rpm all the way to 2,500rpm. That's more twisting force than most of its rivals, including the powerful engines in the Amaze and City. In this state of tune the engine makes 90PS at 4,200rpm which is 15PS less than in the current Vento. And that difference is apparent when you step on it. The 1.5 produces a strong, smooth surge of power all the way from 1,300rpm till it starts to fade at about 4,000rpm but it lacks a bit of the punch from the 1.6-litre in the Vento. That's not to say it's slow - 13.1 seconds to 100kmph is still very respectable for the segment and considerably quicker than the lethargic 16.2 seconds that the old 1.2 Polo took for the same test. Fuel efficiency proves to be very good as well thanks to the strong torque. We didn't have very heavy traffic on our day of testing but the Polo returned a stellar 17.5kmpl in the city and 23.5kmpl on the highway. That's a combined figure of 19kmpl, a number that is going to make owners very happy indeed. It's not just the engine that's new; VW has also worked on tuning the suspension. The old Polo had good ride quality for most parts but it did have a tendency to crash through bigger potholes. Not so with this one - it feels well damped no matter what and simply doesn't get affected by broken roads. There are no unpleasant thuds and the suspension irons out any nastiness in the road with a mature feel that you only get with more expensive cars. In fact, we happen to think this is the new segment benchmark in terms of ride quality - it really is that good. The handling meanwhile retains the soft but stable feel. The car grips very well but you will feel considerable roll at speed so while it's very capable, it's not very involving. 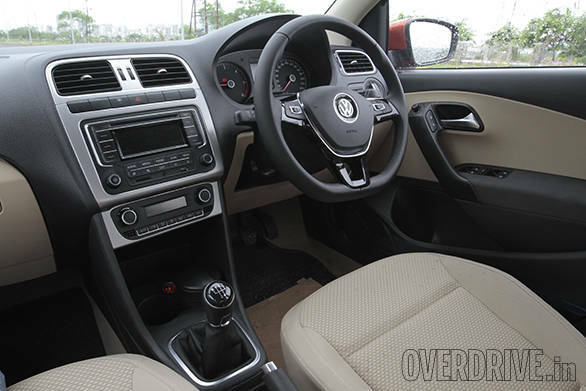 The steering is heavier now compared to the old Polo's feather light feel and while it does return a little more feedback, it's still not very communicative. Volkswagen has made a couple of other small changes to the car as well. The exteriors have been tweaked, but don't feel bad if you don't notice it, the changes are very subtle. The headlamp reflectors are new and the bumper is slightly different with a couple of new strips of chrome. The wheels are new but again, not very different and feature the same 185/60 R15 tyre size. The new Polo however comes with Apollo's new Alnac tyres that run impressively silent and grip well, a definite improvement over the old Aceleres. The rear features slightly redesigned lamps and a tweaked bumper, again very minor changes. Perhaps the biggest visual change is this new shade of orange that turned a few heads. The insides get a couple of changes as well like silver garnish for the centre console, a new digital display in the instrument cluster as well as a new chunky flat bottom steering wheel that looks like it came off a Golf. It looks great and feels good to hold. Other things are the same which means you get a well built but slightly cramped cabin, especially at the rear which isn't very comfortable for taller occupants. 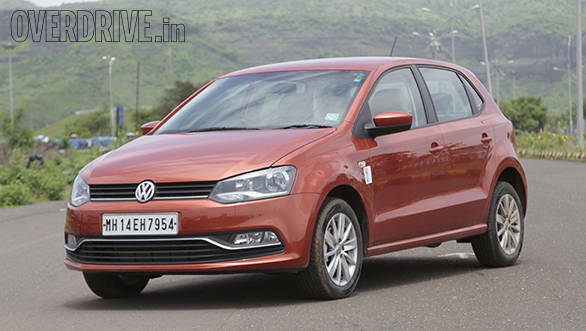 With this new 1.5-litre engine, the Polo finally feels like a complete car. It looks good, is well built, drives well and is also very efficient. But most importantly you now won't regret the (not insignificant) amount of money you've spent on it every time you step on the throttle. 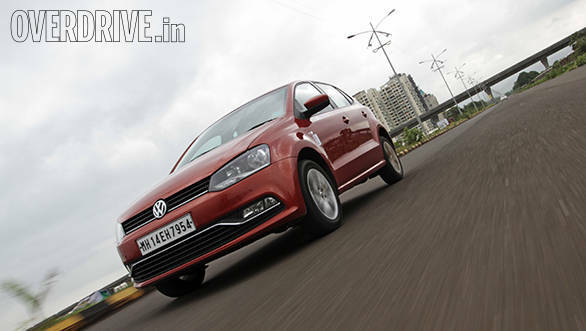 The excise duty benefits have allowed VW to price the Polo closer to the 1.2 but that was not a cheap car to begin with. 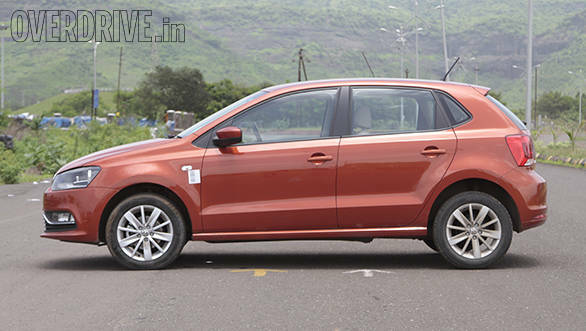 Prices for the Polo TDI start at Rs 6.27 lakh going up to Rs 7.37 lakh for the Highline trim we have driven. If you don't mind the compact rear and the high costs of ownership that come with a VW product, the Polo 1.5TDI makes a great car to own, one that gives you that all important feel good factor every time you drive it. In fact we'd go as far to say that this is the best sub ten lakh rupee hatchback on sale today.